Earlier this week President Obama and Prime Minister Harper put their own political controversies behind them and met for just under an hour in the Oval Office. In terms of positive ink and images, the meeting was expected to benefit the Prime Minister far more than the President. Fresh from his less than successful valedictorian address and his run in with "Jackass" Joe Wilson, Obama was lucky if Harper's visit rated anywhere above negative numbers on the Washington Richter scale. In other words it probably didn't provide Obama with a needed diversion from the previous week's full court press from the media and Republicans. On the other hand, on the brink of a snap election, the timing of the visit for Harper couldn't have been better. 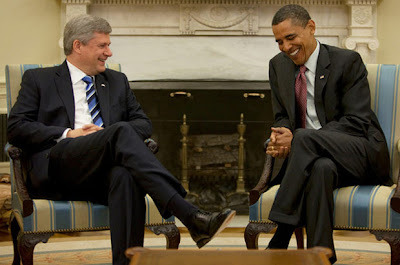 "Mr Harper Goes To Washington" to meet with his good buddy Barack would have been quite the image for the electorate to have in their minds as they trudged to the polls trying to decide who among Canada's political chiefs was the best leader. And Harper wasn't alone. He brought Minister of Public Safety Peter Van Loan, Minister of Environment Jim Prentice and Foreign Affairs Minister Lawrence Cannon. With the latter it might be said Harper trotted out his "big guns". But what is it they say about the best laid plans? Well, to answer my own question, they oft go awry. And that's exactly what happened. As the Prime Minister hopped out of his idling limo at the White House side entrance, the poor guy wasn't met by the outstretched hand of the President of the free world. Rather some junior state department protocol flunky greeted the crestfallen PM. They won't be pasting that photo on the Prime Minister's election pamphlets. "What the hell was that all about at the door?" "Geez, Steve, I was just foolin' with ya." Barack O'boy was probably taking advantage of the indoor plumbing in the Lincoln Bedroom. I'm sure that it wasn't a snub at the PM. More like a "I've got more important things to do..."
Don: Ha, when you gotta go, you gotta go. Might have been payback. 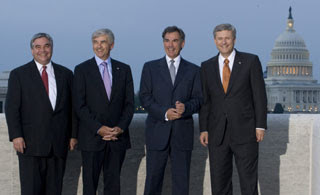 In the last 2 G8 group photo sessions Harper held everybody up - he had to go to the little boy's room. I sure hope they weren't just laughing about the impending Zombie Apocalypse. That would be a travesty! Quirks: Is it upon us? Thanks, you've gotta be my #1 fan.